Hailey was born with a heart defect and required surgery as a baby. She didn’t remember the surgery and never expected to hear the words “you need a heart transplant” when she was just 16 years old. “I never knew I would need a transplant, so it was a big shock when I found out,” Hailey said. Hailey was on the transplant waiting list for six months. It was a difficult six months, which seemed to last forever, but Hailey now realizes that many people wait much longer. 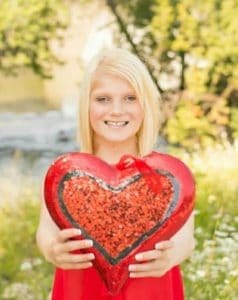 Hailey’s friends told her that they thought she would receive her new heart on February 14 – a heart for Valentine’s Day and National Donor Day. As it turned out, her friends were right. On February 13, 2014, Hailey received “the call” that a heart was available. Hailey was ecstatic. She called all her friends and let everyone know. However, when she got into the car to go to the transplant center, it hit her. She realized someone had to die for her to get a new heart. Her feeling of excitement quickly faded, and she became emotional. Hailey received her heart transplant on February 14. After her transplant, she received a tremendous amount of support from her friends, family, and community. She noted that she received a lot of support and encouragement from the students and teachers at her school and other schools in the area. Her twin sister, Hope, was also a big supporter during her journey. Being a teenager while being a transplant candidate and recipient can be tough; Hailey was unable to participate in many activities during her junior year of high school. 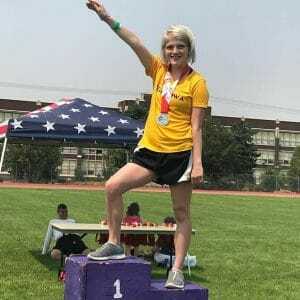 However, she was able to graduate on time and enroll in community college because of a special program her high school offered. Hailey does something each year to celebrate her transplant anniversary. The first year, she had a party, and another year she gave out cookies at the transplant center. Hailey has done a lot to raise awareness about organ donation. She has talked to Drivers Ed classes, spoken at events, volunteered for the Iowa Donor Network, and talked to the media. Hailey also expressed her frustration about transplant and organ donation myths, which can negatively impact donation rates. She encourages people to find a reliable source if they have questions about organ donation.